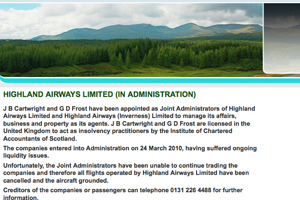 Highland Airways, the Scottish carrier that transports passengers between the mainland and Hebrides, has gone into administration. The airline was forced to call in the administrators last night after a period of difficult trading. All flights have been cancelled with immediate effect, with around 800 people thought to have outstanding flights booked with the airline. Bruce Cartwright, joint administrator and head of business recovery services at Pricewaterhousecoopers in Scotland said that the company had "encountered trading difficulties, including the loss of certain contracts". Highland Airways links some of the Inner and Outer Hebrides to the mainland via Oban and Inverness, as well as operating a Cardiff to Anglesey route. It was founded as Air Alba in 1991, initially delivering newspapers and carrying oil workers, and went on to operate passenger routes a decade later. The airline operated a fleet of nine aircraft on various contracts but had endured a particularly troublesome last six months of trading due to a scaling down of routes as well bad weather that hampered services and grounded the fleet. A Scottish Government spokesman said that the company and Highlands and Islands Enterprise had worked hard to find a solution to maintain the business. "Unfortunately, all options have now been exhausted," he added. "The company has had an ongoing and open dialogue with its clients and every effort will be made to bring in other operators quickly to minimise any break in service provision."